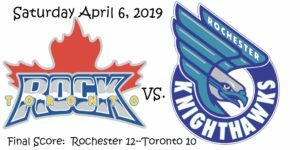 In last weekend’s NLL action the league would see two Eastern Division opponents, the Toronto Rock (10-6) take on the Rochester Knighthawks (4-11) at the Blue Cross Arena in front of a crowd of 4,977 faithful Knighthawks fans. Rochester would come out of the gate holding their own against a very talented and playoff bound Toronto Rock squad. They would take advantage to force the Rock into making a goalie change from Nick Rose to Riley Hutchcraft who in turn was a perfect 14 of 14 for saves. Rochester’s Warren Hill was phenomenal in his own right and was able to help slow a late surge by Toronto giving Rochester back to back wins with a 12-10 win over the Rock. Final Score: Rochester 12—Toronto 10. It would be the Toronto Rock putting up the first score of the first period as well as the last with Rochester filling the gap with two goals of their own. Scoring for the Rock would be Kieran McArdle (1G); and Rob Hellyer (1G, 4A) which would be their only scores on the night. Finding the back of the net for the Knighthawks in the frame would be Kyle Jackson (1G, 2A); and Darryl Robertson (1G, 1A) making it a 2-2 game at the end of one. Rochester would completely dominate the second turning the tide on Toronto as they would outscore the Rock 5-1. Getting the lone score for the Rock would come from Billy Hostrawser (1G); and Rochester getting scores from four different players including Cody Jamieson (2G, 3A); Mike Burke (3G, 1A); Colton Armstrong (1G); and Ryan Benesch (3G, 3A) would net two of his three goals on the night to give the Knighthawks a 7-3 lead heading into halftime. In the third period the Rock would make up some ground on the Knighthawks lead as they would win the goal battle 5-4 but Rochester would strike first on a goal from Burke. Toronto would net two scores at the beginning of the frame coming from Craig; and Dan Lintner (1G) to make it a two goal game but Rochester would still hold the lead 8-5. For the remainder of the third both teams would exchange goals; with Tom Schreiber (2G, 2A) netting two; and Latrell Harris (1G) unassisted, tallying the other for the Rock. Netting other scores for Rochester would come at the hands of Benesch and Cody Jamieson (2G, 3A). Rochester would end the third period with an 11-8 lead. Both teams would slow the place in the final frame as fans would see both sides in a defensive battle with each teams goalies playing lights out. Toronto would still outscore Rochester 2-1 but it wouldn’t be enough as Rochester would hold on to a 12-10 win. Netting both Toronto’s scores would be Johnny Powless (2G, 2A); and Rochester’s Chris Boushy (1G) grabbing an empty net goal to seal the win for the Knighthawks. Rochester has been eliminated from the playoffs so the remainder of the season they’ll play spoilers for the teams they will face before the team moves to Halifax for the 2019-20 season. Toronto is in, and sitting in third place in the East with a record of 10-6. Rochester (4-11) heads west to face the Colorado Mammoth (6-9) on Friday April 12, game time 9:00 p.m. EST. Colorado has yet to clinch a playoff spot so their remaining two games as they will face off against two division rivals, the San Diego Seals (9-6) on Friday April 19; and the Saskatchewan Rush (8-6) on Saturday April 27 are extremely important. Toronto (10-6) will play at home on Friday April 12 against their Eastern Division rivals the New England Black Wolves (8-7), game time 7:30 p.m. EST.